The American National Standards Institute (ANSI) provides standards for general use flat washers. Type A is a series of steel washers with broad tolerances, where precision is NOT critical. 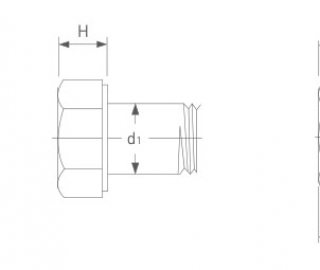 Type B is a series of flat washers with tighter tolerances where outside diameters are categorized as ‘Narrow’, ‘Regular’ or ‘Wide’ for specific bolt sizes. Forms E to G relate to black metal washers. A fender washer is a flat washer with a particularly large outer diameter in proportion to its central hole. They are commonly used to spread the load on thin sheet metal, and are named after their use on automobile fenders. They can also be used to make a connection to a hole that has been enlarged by rust or wear. A penny washer is a flat washer with a large outer diameter, in the UK. The name originally comes from the size of the old British penny. In the UK, most industries refer to all large OD washers as penny washers, even when the OD is as much as twice the size of the old penny. They are used in the same applications as fender washers. A spherical washer is part of a self-aligning nut; it is a washer with one radiused surface, which is designed to be used in conjunction with a mating nut in order to correct for up to several degrees of misalignment between parts. A torque washer is used in woodworking in combination with a carriage bolt; it has a square hole in the centre which the carriage bolt square fits into. Teeth or prongs on the washer bite into the wood preventing the bolt from spinning freely when a nut is being tightened. A split washer or a spring lock washer is a ring split at one point and bent into a helical shape. This causes the washer to exert a spring force between the fastener’s head and the substrate, which maintains the washer hard against the substrate and the bolt thread hard against the nut or substrate thread, creating more friction and resistance to rotation. Applicable standards are ASME B18.21.1, DIN 127B, and United States Military Standard NASM 35338 (formerly MS 35338 and AN-935).Spring washers are a left hand helix and allow the thread to be tightened in a right hand direction only, i.e. a clockwise direction. When a left hand turning motion is applied, the raised edge bites into the underside of the bolt or nut and the part that it is bolted to, thus resisting turning. Therefore spring washers are ineffective on left hand threads and hardened surfaces. Also, they are not to be used in conjunction with a flat washer under the spring washer, as this isolates the spring washer from biting into the component that it is fastening. Where a flat washer is required to span a large hole in a component, a nyloc nut (nylon insert) must be used. The use and effectiveness of spring lock washers has been in debate of late, with some publications advising against their use on the grounds that, when tight, the washer is flat against the substrate and gives no more resistance to rotation than a normal washer at the same torque. However, a spring washer will continue to hold the bolt against the substrate and maintain friction when loosened slightly, whereas a plain washer will not. 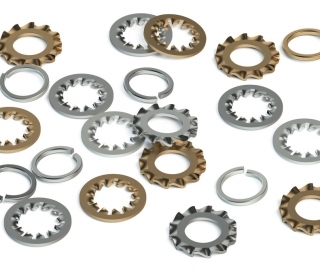 A toothed lock washer, also known as a serrated washer or star washer, has serrations that extend radially inward or outward to bite into the bearing surface. 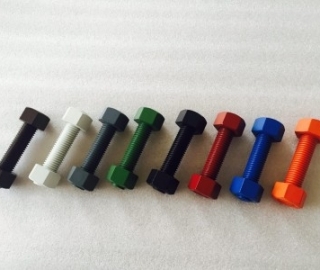 This type of washer is especially effective as a lock washer when used with a soft substrate, such as aluminum or plastic, and can resist rotation more than a plain washer on hard surfaces, as the tension between washer and the surface is applied over a much smaller area (the teeth). There are four types: internal, external, combination, and countersunk. The internal style has the serrations along the inner edge of the washer, which makes them more aesthetically pleasing. The external style has the serrations around the outer edge, which provides better holding power, because of the greater circumference. The combination style has serrations about both edges, for maximum holding power. The countersunk style is designed to be used with flat-head screws. Tooth lock washers are also used for ground bonding where a metal lug or object must be electrically bonded to a surface. The teeth of the washer cut through surface oxides, paints or other finishes and provide a gas-tight conductive path. In these applications the washer is not placed under the head of the screw (or under the nut), it is placed between the surfaces to be bonded. In such applications, the tooth washer does not provide any anti-rotation locking features. We made bolts, nuts, and washer. If you are interested in our company, please feel free to contact us.